A novel optical polishing process, called “Convergent Polishing”, which enables faster, lower cost polishing, is described. Unlike conventional polishing processes, Convergent Polishing allows a glass workpiece to be polished in a single iteration and with high surface quality to its final surface figure without requiring changes to polishing parameters. Suratwala, T., Steele, R., Feit, M., Dylla-Spears, R., Desjardin, R., Mason, D., Wong, L., Geraghty, P., Miller, P., Shen, N. Convergent Polishing: A Simple, Rapid, Full Aperture Polishing Process of High Quality Optical Flats & Spheres. J. Vis. Exp. (94), e51965, doi:10.3791/51965 (2014). Convergent Polishing is a novel polishing system and method for finishing flat and spherical glass optics in which a workpiece, independent of its initial shape (i.e., surface figure), will converge to final surface figure with excellent surface quality under a fixed, unchanging set of polishing parameters in a single polishing iteration. In contrast, conventional full aperture polishing methods require multiple, often long, iterative cycles involving polishing, metrology and process changes to achieve the desired surface figure. The Convergent Polishing process is based on the concept of workpiece-lap height mismatch resulting in pressure differential that decreases with removal and results in the workpiece converging to the shape of the lap. The successful implementation of the Convergent Polishing process is a result of the combination of a number of technologies to remove all sources of non-uniform spatial material removal (except for workpiece-lap mismatch) for surface figure convergence and to reduce the number of rogue particles in the system for low scratch densities and low roughness. The Convergent Polishing process has been demonstrated for the fabrication of both flats and spheres of various shapes, sizes, and aspect ratios on various glass materials. The practical impact is that high quality optical components can be fabricated more rapidly, more repeatedly, with less metrology, and with less labor, resulting in lower unit costs. 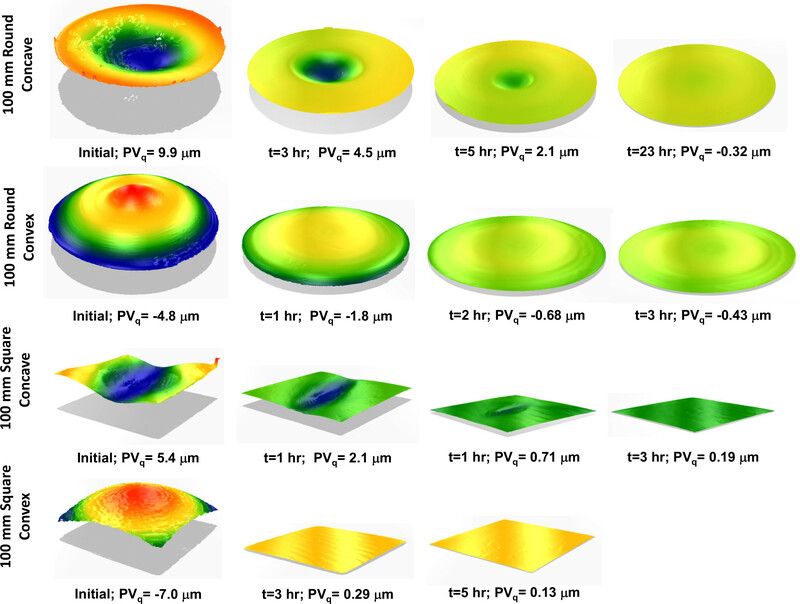 In this study, the Convergent Polishing protocol is specifically described for fabricating 26.5 cm square fused silica flats from a fine ground surface to a polished ~λ/2 surface figure after polishing 4 hr per surface on a 81 cm diameter polisher. The major steps in a typical optical fabrication process include shaping, grinding, full aperture polishing, and sometimes small tool polishing1-3. With increasing demand for high quality optical components for imaging and laser systems, there have been significant advancements in optical fabrication over the last several decades. For example, precision, deterministic material removal is now possible during the shaping and grinding processes with advancements in Computer Numerical Controlled (CNC) glass shaping machines. Similarly, small tool polishing technologies (e.g., computer controlled optical surfacing (CCOS), ion figuring, and magneto-rheological finishing (MRF)) have led to deterministic material removal and surface figure control, thus strongly impacting the optical fabrication industry. However, the intermediate step of the finishing process, full aperture polishing, still lacks high determinism, typically requiring skilled opticians to carry out multiple, often long, iterative cycles with multiple process changes to achieve to the desired surface figure1-3. where dh/dt is the average thickness removal rate, kp is the Preston constant, σo is the applied pressure, and Vr is the average relative velocity between the workpiece and the lap. 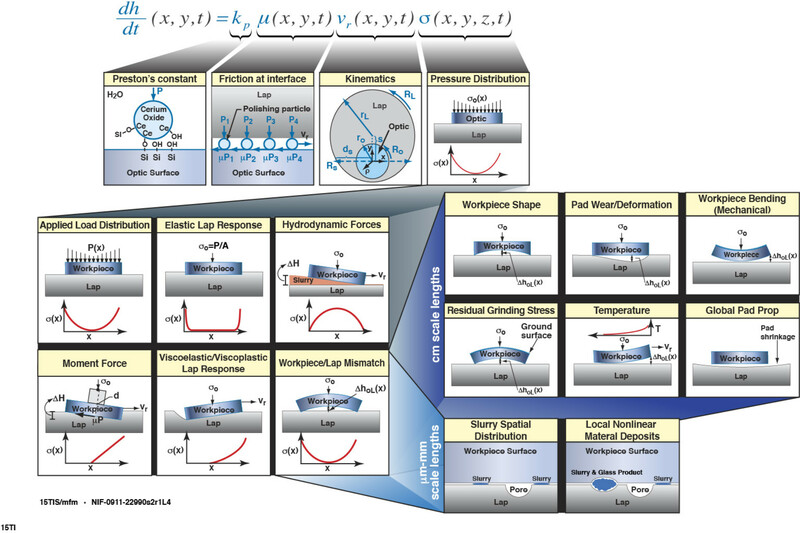 Figure 1 schematically depicts the physical concepts that influence material removal rate as described the Preston Equation, including spatial and temporal variations in velocity and pressure, differences between the applied pressure and the pressure distribution that the workpiece experiences, and friction effects6-8. In particular, the actual pressure distribution experienced by the workpiece is governed by a number of phenomena (described in detail elsewhere6-8) which strongly affect resulting surface figure of the workpiece. Also, in the Preston Equation, the microscopic and molecular level effects are largely folded into the macroscopic Preston constant (kp), which influences the overall material removal rate, micro-roughness, and even scratching on the workpiece. 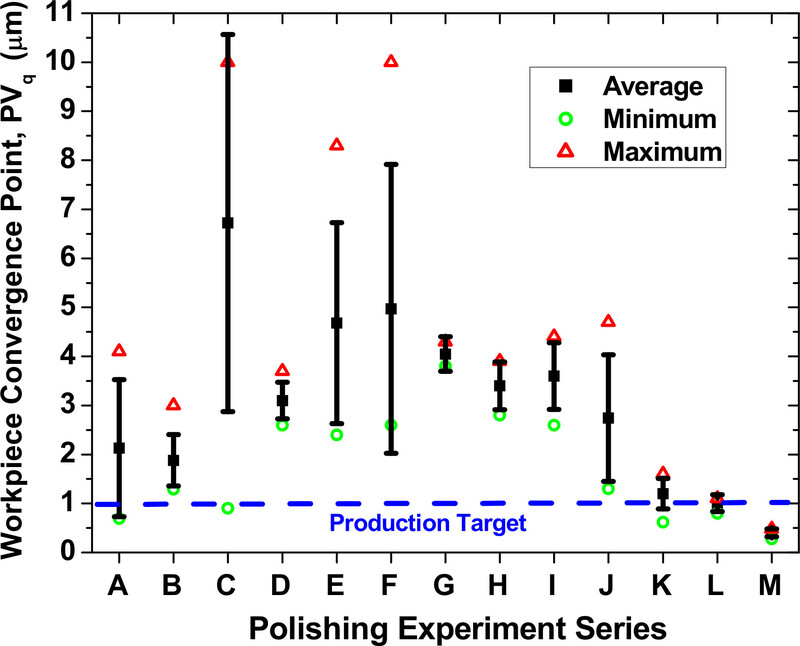 Various studies have expanded Preston’s model to account for microscopic slurry particle-pad-workpiece interactions to explain material removal rate and microroughness9-16. where h̅ is a constant describing the rate at which the pressure declines with an increase in gap ΔhoL6. 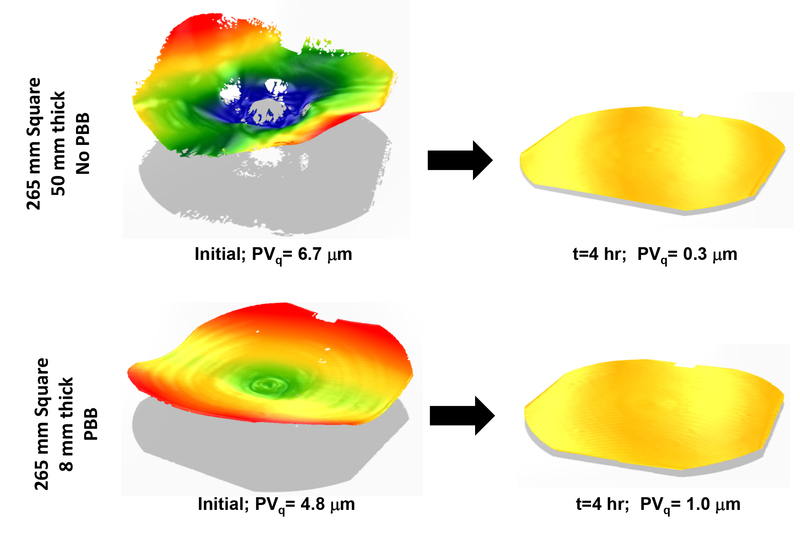 In this example, the workpiece has the highest local pressure in the center (see bottom left of Figure 2), and hence this location will observe the highest initial material removal rate during polishing. As material is removed, the pressure differential across the workpiece will decrease due to a decrease in the workpiece-lap mismatch, and the workpiece will converge to the shape of the lap. At convergence, the workpiece pressure distribution, and hence material removal, will be uniform across the workpiece (see right side of Figure 2). This example is illustrated for a flat lap, however, the same concept applies for a spherical lap (either concave or convex). Again, this convergence process only works if all the other phenomena affecting spatial material non-uniformity have been eliminated. The specific procedural and engineering mitigations implemented in the Convergent Polishing protocol are described in the Discussion. The protocol described in the following study is the Convergent Polishing process specifically for a 26.5 cm square fused silica glass workpiece starting from a fine ground surface. In 8 hours of polishing (4 hours/surface), this workpiece can achieve a polished flatness of ~λ/2 with very high surface quality (i.e., low scratch density). First prepare the Convergent Polishing System (specifically called Convergent, Initial Surface Independent, Single Iteration, Rogue Particle-Free Polisher or CISR (pronounced ‘scissor’))7,17 by installing the pad & septum, conditioning the pad, diluting & chemically stabilizing the slurry, and incorporating the slurry within the filtration system. On the CISR polisher, adhere a polyurethane pad onto the granite lap base. Adhere pad one edge first and apply pressure in the direction towards the opposing edge to minimize air gaps. Trim the overhanging pad and then use a razor blade and roller to puncture and remove air bubbles if necessary. For first time use and after every ~100 hr of polishing, diamond condition the pad using a CMP diamond conditioner (50 mm diameter; 0.6 psi applied pressure; 5 min dwell at each radial lap location with 25 mm spacing increments; lap rotation 25 rpm) with flowing DI water. Between polishing iterations, remove any residual slurry and glass products from the pad using an in-situ ultrasonic cleaner (~2 min dwell at each radial location; lap rotation 5 rpm) with flowing DI water. On the uniquely shaped septum weight, adhere double sided foam tape and then the septum material (e.g., pre-cut glass or other non-wearing material). Trim any overhanging foam tape to match the shape of the septum material and weight. Note the septum design (both shape and weight) changes for different sizes of the workpiece and lap7,17. Prepare polishing slurry to Baume 4 concentration (specifically mix by volume ~1 part cerium oxide polishing slurry and ~9 parts deionized (DI) water in a 11 L bucket). Check Baume using a Baume float. Add ~5 ml of KOH (10 M) to adjust pH to 9.5 and add ~120 ml (1 vol%) of proprietary surfactant19. Readjust pH and Baume every 24 hr of polishing. Install bucket with the prepared slurry into filtration system. Then install the desired CMP particle filters into filtration system. Let slurry recirculate within filtration system for several hours. Measure particle size distribution of slurry (e.g., using single particle optical sensing techniques) to ensure the tail end of the distribution is adequately rogue particle-free9,20. Before polishing, chemically etch the as-received fine ground workpiece to reduce the amount of material removal needed to remove the sub-surface grinding damage21. Then, block the workpiece (if the aspect ratio (i.e., length/thickness) is >10) using a novel pitch button blocking (PBB) technique to prevent the workpiece from bending during blocking and polishing22. Etch the fine ground workpiece (specifically a 265 x 265 x 8 mm3 fused silica glass flat) in a tank filled with HF:NH4F (6:1 buffered oxide etch (BOE) 3x diluted with DI water) for 6 hr removing 10 µm of glass from surface of workpiece. CAUTION! BOE is extremely hazardous; wear appropriate personal protective equipment (PPE) . Remove workpiece from etch tank and aggressively rinse the workpiece with DI water and allow the workpiece to air dry vertically. Inspect the workpiece for deep damage during the grinding process using a bright light inspection in a dark room. If no deep damage is found, proceed to the next step, else send workpiece back for re-grinding. Heat up blocking pitch in a glue gun to ~95 ºC and place droplets (also called buttons) of pitch (~0.06 g) onto the face of the blocking plate in a 9 x 9 array (81 buttons with 26 mm spacing). For different size workpieces, refer to design rules for the ideal number, size, and spacings of pitch button22. Place the blocking plate with the applied buttons face up in a pre-heated oven at 70 ºC. Apply tape to the face of the workpiece that is not to be polished. Avoid generating air bubbles or excessively stretching the tape. Place the workpiece with tape side face down onto buttons on the blocking plate in the oven. Cover the workpiece-button-block to minimize convective flow. After 1.5 hr, set oven to cool 10 ºC/hr to room temperature. After cooling, the pitch thickness on the blocked workpiece should be ~1 mm. Turn on humidity system in environmental chamber of CISR polisher to prevent slurry from drying during polishing and to minimize rogue particles scratching the workpiece. Install and mount the specifically designed and prepared septum into polisher. Install PBB workpiece into CISR polisher and lower boom to hold the workpiece. Polish workpiece on CISR for 4 hr at a matched lap and workpiece rotation rate of 25 rpm with a radial stroke of ~75 mm and with a slurry flow from filtration system of 1 gal/min. NOTE: The blocking plate also serves as the loading weight on the workpiece corresponding to 0.6 psi applied pressure. Turn off lap and workpiece rotation and slurry flow. Remove PBB workpiece from CISR polisher and submerse it into DI water filled bath. Wipe workpiece surface with cleanroom cloth while submerged. Remove PBB workpiece from bath and spray rinse with DI water. Deblock workpiece by inserting a shim at workpiece-block interface. Remove tape from workpiece surface. Aggressively rinse workpiece with DI water and air dry. PBB the opposing face of the workpiece as described in Section 2. Then repeat polishing procedure as described in Section 3. Measure reflected wavefront (i.e., surface figure) of both sides of workpiece as well as transmitted wavefront using an interferometer. Mount workpiece on bright light inspection station and measure the scratch/dig properties using optical fabrication standard methods. A short BOE etch of the workpiece, as described in step 2.1, can be used to expose hidden scratches for workpieces used in high fluence laser applications. For measurement of fine scratches or roughness on the workpiece, standard optical microscopy or white light interferometry may be used. Store completed workpiece in a container minimizing contact with face of the workpiece. The Convergent Polishing protocol described above allows a ground fused silica workpiece (in this case a 26.5 cm square) to be polished, in a single iteration of 4 hr per surface, to a peak-to-valley flatness of ~λ/2 (~330 nm) for low aspect ratio workpieces and ~1λ (~633 nm) for high aspect ratio workpieces (see Figure 3). Again, this process repeatedly converges workpieces to the same final surface figure without requiring changes to polishing parameters and is independent of the initial surface figure. Also, a high workpiece average removal rate of ~4 µm/hr is consistently achieved using the conditions described above, which enables a fast convergence and enough material removal to ensure removal of all the sub-surface damage from the ground surface. A typical, fine ground workpiece surface (e.g., treated with 9 µm alumina loose abrasive) has a sub-surface mechanical damage depth of ~10 µm before bulk etching and ~4 µm after etching; hence at least this amount of material needs to be removed from each lateral location on the workpiece surface23,24. Other examples of surface figure convergence using the Convergent Polishing process on various round and square workpieces with different starting surface figures (both concave or convex) are shown in Figure 4. The impact of chemical stabilization of the polishing slurry19,20, combined with using an engineered particle filtration system and a hermetically sealed high humidity environment during polishing, on the tail end of the particle size distribution is shown in Figure 5a. Notice the significant reduction in the larger particles (referred to as rogue particles) in the slurry. The rogue particles are known to impact both the propensity of scratches on the workpiece and cause an increase in overall surface roughness9,25. The corresponding reduction in fine scratches on the workpiece is illustrated in Figure 5b. Figure 1: Schematic illustration of the Preston equation. (Eq. 1) describing the phenomena that effect spatial and temporal material removal during polishing8. 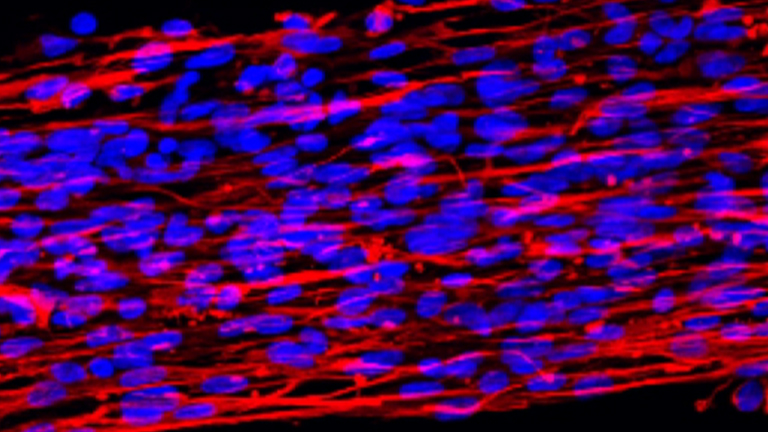 Please click here to view a larger version of the figure. Figure 2: Illustration of workpiece shape. (top) and interface pressure distribution (bottom) with polishing time (t) during Convergent Polishing. Please click here to view a larger version of the figure. Figure 3: Typical initial and final surface figures (full scale -4 to 2 µm) after Convergent Polishing of 265 mm square fused silica workpiece flats. Please click here to view a larger version of the figure. Figure 4: Examples of surface figure evolution of various size and initial shape workpieces after Convergent Polishing7. Please click here to view a larger version of the figure. Figure 5; (a) Particle size distribution improvement in cerium oxide polishing slurry (Hastilite PO) and (b) workpiece scratch distribution improvement (measured after Convergent Polishing and HF etching using scanning optical microscopy) as a result of chemical stabilization and engineered filtration19,20. Please click here to view a larger version of the figure. Figure 6: Surface figure (as described by peak-to-valley surface height) convergence point value and repeatability of the workpiece for various polishing experiment configurations during the development of Convergent Polishing. For each experiment series, the magnitude (average) and the repeatability (standard deviation and min/max) are noted. Note PVq is the Peak-to-Valley surface height reported as the maximum height difference on the measured surface after the 1% lowest and highest data points have been discounted to minimize sensitivity due to anomalous data points. Please click here to view a larger version of the figure. 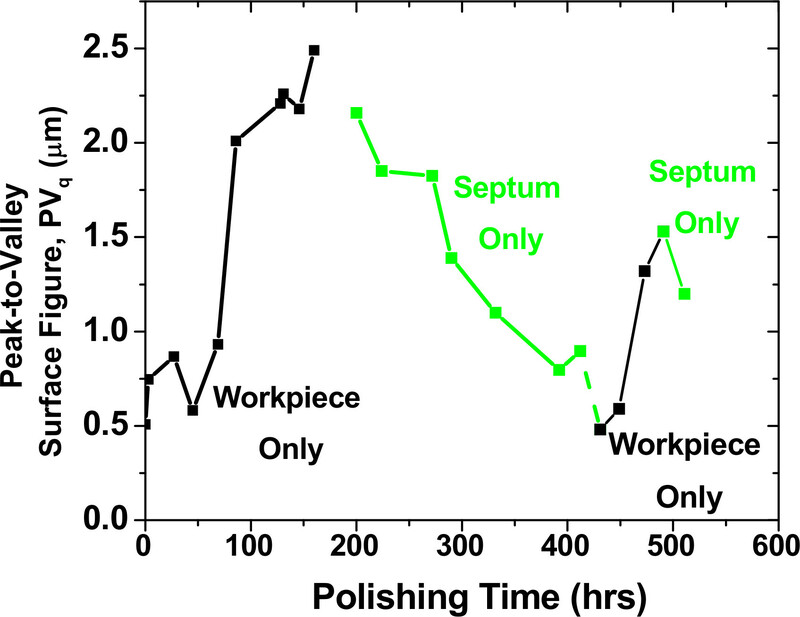 Figure 7: Surface figure (as described by peak-to-valley surface height) of the workpiece versus polishing times using workpiece only or septum only configurations. This illustrates how the convergence point can be tailored by change in polishing configurations. Please click here to view a larger version of the figure. As discussed in the Introduction, successful implementation of Convergent Polishing with respect to surface figure involves eliminating or minimizing all the phenomena that influence spatial material non-uniformity except that of workpiece-lap mismatch due to workpiece shape. If any one of these phenomena is not appropriately mitigated, either through process control or through appropriate engineering of the polisher, then the desired convergence point cannot be achieved or maintained; hence essentially every mitigation becomes critical. To illustrate this, Figure 6 shows the magnitude and repeatability of the convergence point surface figure on the workpiece (represented as peak-to-valley surface height) as a function of various polishing experiments series conducted during the course of development of Convergent Polishing. With each experiment series, a new mitigation was implemented. The last experiment series (Series M), now representative of the Convergent Polishing protocol and system, shows a low and repeatable convergence point. As a result, the Convergent Polishing protocol and system is a combination of a number of developed technologies allowing for convergence in surface figure, high material removal rate, and high surface quality (low scratch densities, low surface roughness) through minimization of rogue particles. The key enabling technologies include: a novel shaped septum which is a glass or non-wearing material loaded on to the pad that compensates for non-uniform pad wear, improves temperature uniformity, improves slurry distribution, and reduces viscoelastic pad edge effects6,7,17; bulk etching which allows for more rapid removal of sub-surface damage and reduces the amount of material to be removed from the workpiece during polishing as well as removes grinding stress which can cause workpiece to bend altering the convergence point7,21,23-24; Pitch Button Blocking (PBB) which allows for blocking a high aspect ratio workpiece preventing it from bending during blocking and polishing with low risk of scratching the opposing workpiece surface22; radial stroke which results in improved material removal spatial time averaging during polishing, preventing high frequency ripples that can occur on a workpiece surface8; balanced 3-body wear of workpiece, septum and lap which provides a desired, stable shape of the lap and hence a more stable convergent point of the workpiece; hermetically sealed high humidity polishing chamber which prevents entry of external rogue particles and prevents formation of dried slurry agglomerates which are common sources of workpiece scratching; also reduces chance of pad drying and permanently deforming the lap shape17,18,25; engineered filtration system which improves and maintains a desired slurry particle size distribution improving surface roughness and reducing probability of scratch formation; this includes features of fluorinated piping, minimized dead zones, and controlled flow velocities preventing slurry settling, agglomeration, and contamination17; chemical slurry stabilization which reduces the number and size of agglomerates in the slurry without sacrificing material removal rate using surfactants that follow a novel ‘Charged Micelle Halo’ chemical mechanism19,20; and in situ ultrasonic pad treatment which allows for removing slurry and glass product deposits from lap surface which helps maintain high material removal rates and minimizes mid-range spatial scale length workpiece shape degradation due to preferential material deposit8. In addition, Convergent Polishing takes advantage of known technologies within the optical fabrication community to eliminate non-uniform spatial material removal. These include: constant time-averaged velocity using matched rotation (workpiece rotation rate=Lap rotation rate)3; edge driven workpiece to prevent moment force workpiece bending6; uniformly applied loading; load and velocity adjusted to operate in contact mode6; stiff lap base to prevent bending under load; careful pad selection to provide quick convergence and good slurry transport; appropriate Baume and pH maintenance of polishing slurry; and submerged water cleaning processes for the workpiece to prevent slurry staining2,26. Several strategies can be employed to shift the convergence point, which may sometimes need to be tuned due to variability in the thickness uniformity or flatness of the as-purchased pad. Polishing with workpiece only drives the workpiece convergence point convex, while polishing with septum only drives the workpiece convergence point concave. In addition, the pressure ratio between workpiece and septum can be adjusted, and the pad can be custom shaped using diamond conditioning. Figure 7 illustrates the effect of workpiece only or septum only polishing to modify the convergence point. Once the convergence point is established at the desired value, then it can be maintained for long polishing times (many hundreds of hours) using the Convergent Polishing process. Convergent polishing has the following advantages: polishing parameters are fixed and remain the same during and between polishing runs regardless of the initial surface figure of the workpiece; polishing can be accomplished in a single iteration from a ground surface, requiring less polishing time and less metrology; and polishing is performed in a rogue particle-free environment leading to little or no scratching on the workpiece. Ultimately, these advantages lead to the ability to make high end optical components faster and cheaper. Potential applications of Convergent Polishing include manufacturing of optics used in high power or high energy laser or optical systems, as well as the general manufacturing of optical flats and spheres. The Convergent Polishing process has been demonstrated on fused silica glass, borosilicate glass, and phosphate glass workpieces. It has also been demonstrated on round and square workpieces over a size range of 50-265 mm and on flats and spheres. The procedure detail in this study is specifically for a finishing flat, square fused silica workpiece 26.5 cm in size. For other size optics, spheres, or other glass materials, the equipment may need to be modified (e.g., the size/shape of the lap, shape of the septum, and slurry used). The overall process and system of Convergent Polishing is covered by various patents or patent applications17-19. This work performed under the auspices of the U.S. Department of Energy by Lawrence Livermore National Laboratory under Contract DE-AC52-07NA27344 within the LDRD program. Thompson, B., Malacara, D. Ch 28. Handbook of optical engineering. Optical fabrication. CRC Press. (2001). Karow, H. Fabrication Methods for Precision Optics. Wiley. (1993). Brown, N. J. A short course in optical fabrication technology. Optical Society of America Annual Meeting, 1981 Oct 26, Orlando, FL, USA, Lawrence Livermore National Lab. (1981). Cook, L. Chemical processes in glass polishing. J. Non-Crystal. Solids. 120, 152-171 (1990). Preston, F. The Structure of Abraded Glass Surfaces. Trans. Opt. Soc. 23, (3), 141-14 (1922). Suratwala, T., Feit, M., Steele, R. Toward Deterministic Material Removal and Surface Figure During Fused Silica Pad Polishing. J. Am. Ceram. Soc. 93, (5), 1326-1340 (2010). Suratwala, T., Steele, R., Feit, M., Desjardin, R., Mason, D. Convergent Pad Polishing of amorphous fused silica. International Journal of Applied Glass Science. 3, (1), 14-28 (2012). Suratwala, T., Feit, M., Steele, R., Wong, L. Influence of Temperature and Material Deposit on Material Removal Uniformity during Optical Pad Polishing. J. Am. Ceram. Soc. (2014). Suratwala, T. Microscopic removal function and the relationship between slurry particle size distribution and workpiece roughness during pad polishing. J. Am. Ceram. Soc. 91, (1), 81-91 (2014). Terrell, E., Higgs, C. Hydrodynamics of Slurry Flow in Chemical Mechanical Polishing. J. Electrochem. Soc. 153, (6), 15-22 (2006). Runnels, S., Eyman, L. Tribology Analysis of Chemical MechanicalPolishing. J. Electrochem. Soc. 141, (6), 1698-1701 (1994). Park, S., Cho, C., Ahn, Y. Hydrodynamic Analysis of Chemical Mechanical Polishing Process. J. Tribology Int. 33, 723-730 (2000). Luo, J., Dornfeld, D. Effects of Abrasive Size Distribution in Chemical Mechanical Planarization: Modeling and Verification. IEEE T. Semicond. M. 16, (3), 469-476 (2003). Luo, J., Dornfeld, D. Material Removal Mechanism in Chemical Mechanical Polishing: Theory and Modeling. IEEE T. Semiconduct. M. 14, 112-133 (2001). Bastaninejad, M., Ahmadi, G. Modeling the Effects of Abrasive Size Distribution, Adhesion, and Surface Plastic Deformation on Chemical Mechanical Polishing. J. Electrochem. Soc. 152, (9), 720-730 (2005). Sampurno, Y., Sudargho, F., Zhuang, Y., Ashizawa, T., Morishima, H., Philipossian, A. Effect of Cerium Oxide Particles Sizes in Oxide Chemical Mechanical Planarization. Electrochem. Solid State. 12, (6), 191-194 (2009). Suratwala, T., et al. Method and system for Convergent Polishing. US Provisional Patent Application. 027512-006200US 61454893 (2011). Suratwala, T., Feit, M., Steele, R. Apparatus and Method for Deterministic Control of Surface Figure During Full Aperture Polishing. US Patent Application. US. 12/695,986 (2010). Dylla-Spears, R., Feit, M., Miller, P., Steele, R., Suratwala, T., Wong, L. Method for preventing agglomeration of charged colloids without loss of surface activity. US Provisional Patent Application. IL-12647 (2012). Dylla-Spears, R., Wong, L., Miller, P., Feit, M., Steele, R., Suratwala, T. Charged Micelle Halo Mechanism for Agglomeration Reduction in Metal Oxide Particle Based Polishing Slurries. Colloid Surface A. 447, 32-43 (2014). Wong, L., Suratwala, T., Feit, M., Miller, P., Steele, R. The Effect of HF/NH4F Etching on the Morphology of Surface Fractures on Fused Silica. J. Non-Crystal. Solids. 355, 797 (2009). Feit, M., DesJardin, R., Steele, R., Suratwala, T. Optimized pitch button blocking for polishing high-aspect-ratio optics. Appl. Opt. 51, (35), 8350-8359 (2013). Suratwala, T., et al. Sub-surface mechanical damage distributions during grinding of fused silica. J. Non-Crystal. Solids. 352, 5601 (2006). Miller, P., et al. The Distribution of Sub-surface Damage in Fused Silica. SPIE. 5991, (2005). Suratwala, T., et al. Effect of Rogue particles on the sub-surface damage of fused silica during grinding/polishing. J. Non-Crystal. Solids. 354, 2003 (2008). Suratwala, T., Miller, P., Ehrmann, P., Steele, R. Polishing slurry induced surface haze on phosphate laser glasses. J. Non-Crystal. Solids. 351, 2091-2101 (2004).